Share this product and receive a $1.69 sharing discount. 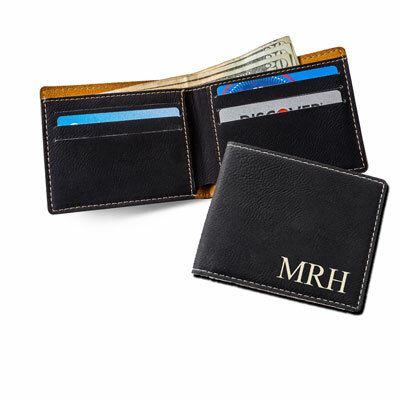 Our personalized leatherette wallet is a great gift to give. Made of simulated suede leather. The inside boasts 6 credit card slots and of course a bill holder. The outside sports a special someone's initials. Measures 4 1/2" x 3 1/2". Great for a Confirmation, Baptism, Graduation, Father's Day or Birthday gift!